When our bodies stay in one position or place for too long, we feel physical stress. This can add to fatigue and tense muscles, and can contribute to headaches and other pain. Repetitive arm and hand motions as in computer use can also lead to carpal tunnel syndrome and can exacerbate arthritis in the joints of the hands and arms. When we are actively engaged with one of our stressors (work, a difficult person, the environment, our own negative perceptions, etc. ), we can also feel physical and mental stress. Physical exercise helps us control our weight, keeps our hearts healthy, helps us stretch our muscles, and keep our joints supple. It also can help us manage our stress. Stepping away from our desks or work sites can remove us from our stressors and help relieve the pressure we feel. Stretching and deep breathing are also good tools to relieve tension, as well as more intense aerobic activity like playing sports, jogging, or dancing. Physical activity can also help us prevent fatigue, can improve our sleep, and can boost our immune systems. When we are under stress, our bodies can produce up to 1500 biochemical reactions. Oxygen and glucose rushes to our cells, and neurotransmitters and hormones are pumped out. All this prepares our bodies to fight or run. Our brains and other organs generate byproducts and wastes from all of this chemical activity. The build up waste products can slow down brain function and make us feel fuzzy-headed or foggy. Physical activity increases blood flow to the brain and helps remove these waste products faster. We, therefore can think more clearly and intensely. Exercise also releases endorphins that can make us feel a sense of well-being. Runner's high is a direct result of endorphin release in the brain, but it can also happen with less intense physical movement. Physical activity can offer us an opportunity to release negative emotions. We may not be able to do anything about our disagreeable co-workers or adjust our workload, but we can run, dance or chop firewood. The intensity of the activity can help us get rid of these pent-up emotions. Though all types of physical movement are beneficial for our bodies, some kinds of activities have added benefits. Dance and Eastern practices like yoga and Tai Chi and repetitive aerobic activities (such as hiking, swimming, cycling, cross country skiing, or jogging) are perfect vehicles for finding our body sense, developing grace and poise, relaxing through moving meditation, and enhancing our creativity. Body awareness is an inner sense of our muscles, our balance, and where our bodies are in space. If we are tuned into our bodies, we can learn to recognise when our bodies are pumping out stress hormones and we feel our hearts racing and our bodies tense. We can then apply relaxation techniques to head off the stress response. We can use repetitive movements like yoga, dance, Tai Chi, and other physical activities to focus on what our bodies are doing and can help us relax and reach an inner calmness. 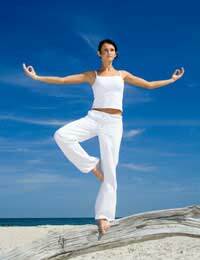 The repeated movements of these activities help us focus on our bodies and can calm the mind. Sometimes, we can enter into an altered state of consciousness. This then is called moving meditation. Ballet, modern dance, Middle Eastern or Oriental dance (bellydance), hula, and Latin dance forms are graceful. These dances can help us relax and center and can also energise us. They strengthen the lower back and pelvis, the place of a woman's center of gravity, where balance begins. The gracefulness of these dances can help us develop poise and self-confidence and our own inner and outer grace. These skills are powerful tools for coping with high stress levels and can help you develop a more positive perspective. Self-confidence helps develop healthy boundaries and can allow you to say NO more often. You might even become less upset by disagreeable co-workers because you see them and their behaviors differently. Going for a walk or doing stretches at our desks are ways to de-stress and can help us enter the creative flow. Moving the whole body is best, especially when both arms can cross the body. Moving both sides of the body is crucial for the balance and flow of the chi or energy within. Movement that is more meditative or graceful can be especially helpful in boosting creativity. However, any physical movement can clear the mind and body and prepare us for a more in-depth experience with creative activities. Participating in physical movement, whether alone or with others, allows us to escape from the stressors in our lives and helps not only our bodies, but our minds and spirits. Is the Gym the Only Place to Go?